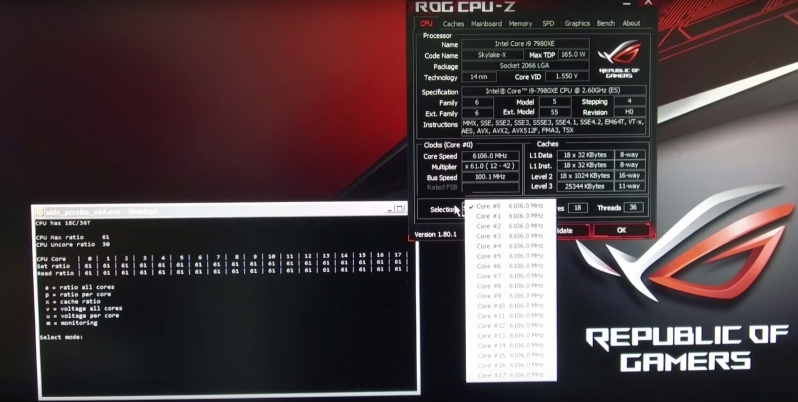 Read more on Intel's i9 7980XE being overclocked to 6.1GHz on all cores. the 7980XE reviews are actually quite impressive. We all knew it was going to be a beast, but it doesn't seem like shoehorned in product as much as I thought it would. 7980XE still is a somewhat shoehorned product. It is an actual Xeon CPU rebranded and tweaked (modified) to fit the HEDT market. Now, Xeon CPUs are well-known for their reliability which implies high quality, higher than any desktop CPU, with Intel employing additional testing and certification (which, among other factors, is the reason for them being as expensive as they are), making sure they are the best CPUs Intel has to offer. So, best silicon, more testing, higher quality all of which would easily translate into high overclockability which we see here but let's not ignore the fact it was pulling 1000W and heating LN2 to above 0 which means it's only the quality of the dies that is "holding the CPU together". Also, let's not ignore the fact that the architecture in that CPU is less new than some previous generations of Intel CPUs which begs the questions - "Where were you Intel?" and "Why now?". Ah yes, competition. So, how long would it have been before we saw something like this had AMD not released a CPU which may not beat this in performance but surely does in features, price and hence - value. And you can have two AMD Threadrippers for the price of one 7980XE and two Threadrippers wipe the floor with the 7980XE in performance. Heck, forget AMD, forget Threadripper. You can have two 18-core/36-thread Intel CPUs on ONE board, overclocked, for less than one 7980XE. That would wipe the floor with the 7980XE in performance as well. So yes, 7980XE is a jerk reaction and Intel's fear of competition for which it's definitely "shoehorned". I really find these LN2 articles a bit pointless as they mean very little. Unless the end user can use a cooling solution 24/7 like custom water for example it means absolutely nothing. Even if you could overclock a 7980XE to 50 ghz on LN2 it is totally pointless as the average end user will still only get around 4.4 to 4.6 on water. I bet you're a buzz kill at a party going around explaining why alcohol is bad for people and that people at said party should stop drinking because it's not logical to poison your body. You forget it's about having fun. It's just for world records... Who cares about the average user? It's a world record! It's a fun hobby. I'd also wager if they clocked this at 50ghz you'd be impressed. I like lots of alcohol as that is something an average user can do !!! This isn't about the average user. You don't become a famous overclocker because you are average. Could also be said all the overclocking you do is beyond a average user. You have probably more hardware bought than the average PC gamer will in his lifetime(except Dice ) That's far above average as well. Sure you can say that the average person doesn't need to buy as much to OC, but it could also be argued the average person doesn't even use water cooling either. Which further means your argument for average is titled into your point of view of what your average actually is. PC gaming isn't a niche market, but water cooling is. We could go on and on about it, but this is article is about how mentally insane it is to have an 18core CPU consuming over 1000 watts. It's just a very interesting article and honestly a technical achievement by both Intel and Roman. I am actually very disappointed with EVGA at the moment as the Kingpin 1080 Ti is a bit of a flop with performance no better than my FE 1080 Ti cards. I was going to get some Kingpins but the lack of performance killed that idea. I have invested the money in other more exciting toys that will be with me in the next couple of weeks. Surely there's some useful relative comparison between chips? If one chip can do 6GHz on LN2 and has been know to do 4.5GHz on water 24/7, is it more likely that a new chip doing 6.5GHz on LN2 could do say 4.8GHz on water 24/7? I guess you can compare benches on water, possibly not 24/7 stable.